There are few experiences that you can truly call once-in-a-lifetime moments. Almost certainly, crossing the Arctic Circle will be one. On this itinerary, you can look forward to many others. After all, how many times in one lifetime will you get to walk on a glacier like you’ll experience at Athabasca Glacier on the Icefields Parkway? How often will you get the chance to cruise through Glacier Bay? As magnificent as Lake Louise may be, how often will you get to visit? And that’s not even considering the many wondrous moments that will happen without us orchestrating them – chance encounters with wildlife, or spectacular sunrises that no tour operator can arrange in advance. Any way you look at it, you can look forward to many moments on this journey that you’ll never experience again. Welcome to Eastern Canada. Your wonderful journey begins with a two night stay at the Fairmont Royal York. This stunning hotel has welcomed royals, presidents and dignitaries alike, and today it will welcome you. Head to the stunning Niagara Falls and feel the mist of the falls as you cruise to its base. Tonight, enjoy a ‘Welcome to Canada’ dinner with your Tour Director and fellow travellers. Be treated to stunning views of Canada’s largest city and Lake Ontario from the Observation Deck at CN Tower. Continue to Ottawa, Canada’s elegant capital city, for a two night stay at the Fairmont Château Laurier, located just steps away from Parliament Hill. Discover the charm of Canada’s capital on a guided tour. Nowhere is Canada’s bilingual culture more evident than in Ottawa. The Rivière des Outaouais marks the provincial border between English-speaking Ontario and French-speaking Québec. Tour Canada’s national museums, take a ByWard Market Culinary tour, or cruise along the Ottawa River. Tour by helicopter, on foot or by horse and carriage. Alternatively, sample local delicacies. Today, it’s up to you. Visit the exquisite Notre-Dame Basilica, with its imposing Gothic Revival architecture. You’ll celebrate the conclusion of your Canadian jaunt at Fairmont The Queen Elizabeth with a sumptuous farewell dinner. Fly to Vancouver (flight not included in land only tour price) for a two night stay at the exclusive and centrally located Fairmont Hotel Vancouver. You’ll get to celebrate with a ‘Welcome to Western Canada’ dinner this evening. Enjoy the tranquillity of Capilano Suspension Bridge Park, open early exclusively for Scenic guests. This afternoon, take a city tour of Vancouver. Embark on one of the most iconic rail journeys in the world, the Rocky Mountaineer. Be pampered by the GoldLeaf Service in your glass dome carriage. Tonight stay at a Kamloops hotel as assigned by Rocky Mountaineer. Feel your awe and excitement peak as you carve through otherwise inaccessible terrain into the Canadian Rockies. Arrive into Lake Louise for your two night Special Stay in a Lakeview room at the iconic Fairmont Chateau Lake Louise. Set a sunrise wake-up call for a special treat to catch the first glimpse of the stunning colour changes painted across the mountain, lake and glacier outside your window. Meet a wearer of the famous red serge, a Canadian Mountie. Fine or casual dining – you decide. Small town charm nestled in stunning mountain scenery greets you in Banff. Choose from a range of restaurants. Enjoy mountain or valley views during your two night Special Stay at Fairmont Banff Springs. Today, you can be as active or as relaxed as you wish. Get ready for a Rocky Mountain experience like no other. This evening take in the magnificent Rocky Mountains soaring above as you feast on the very best of the region’s fresh local produce. Later head out at dusk on a unique wildlife spotting experience in search of Banff’s magnificent beasts including deer, elk, caribou and the elusive grizzly bear. Important: Please note that this experience is subject to weather conditions. In the event of inclement weather or other operational difficulties, this experience may be replaced with an alternative activity. After an ‘Ice Explorer’ ride on Athabasca Glacier, settle into Fairmont Jasper Park Lodge for a two night stay. Dine at a restaurant of your choice. Choose your level of adventure in the ultimate outdoor playground. Enjoy a fascinating voyageur presentation tonight. On arrival in Whistler, visit Squamish Lil’wat Cultural Centre where a First Nations ambassador treats you to a unique cultural experience. Enjoy a presentation on the black bear by expert researcher Michael Allen. Settle in for a two night Special Stay at the exclusive Fairmont Chateau Whistler. Choose between some of the finest restaurants in Whistler. Choose your Whistler activity today. The more active can zipline or take a jet boat ride. Alternatively, take a mountain adventure tour or the Peak 2 Peak gondola. Check in for your exclusive two night Special Stay at The Fairmont Empress. Floatplane flight - Soar over Georgia Strait on an optional floatplane flight to Victoria (additional expense). Choose from a range of experiences. Embark on your luxurious seven night voyage with Princess Cruises. Watch for wildlife from your Verandah Stateroom and enjoy included drinks with dinner each night. Cruise northwards on board your elegant cruise ship. Your welcome lunch is a great way to celebrate your adventures at sea. Explore Alaska’s first city, now known as the ‘salmon capital of the world’. Alaska’s state capital is only accessible by air or sea. This is one town you can explore without ever getting lost. Discover the historic shop facades, wooden boardwalks and echoes of the gold rush that typify Skagway. A steaming cup of hot chocolate will keep you warm as you are mesmerised by the dramatic ice walls of Glacier Bay National Park and Preserve. Some of the glaciers of College Fjord are 40 storeys high and tower over even the largest cruise ship. Celebrate the end of your cruise with a toast at your farewell reception. Visit Alaska’s Wildlife Conservation Centre. Enjoy a jet boat ride before your Special Stay at Mt McKinley Princess Wilderness Lodge. Denali flightseeing - Optional flightseeing over Denali, with glacier landing (additional expense, subject to seasonal operation. Replaces jet boat ride). Visit Joanne Porterfield’s homestead and learn about early Alaskan life. Journey on Princess Rail to McKinley Chalet Resort for a two night Special Stay. Explore Alaska’s rugged wilderness today. Cruise into the heart of Alaska on the ‘Discovery III’ Sternwheeler. See a bush floatplane take off, meet champion sled dogs, and discover village life. Stay two nights at Fairbanks Princess Riverside Lodge. Thrill at the excitement of crossing the Arctic Circle by air and receive a certificate to prove it. Stop at a wilderness community for a fascinating insight into the history of the region and life today. Truly a once-in-a-lifetime adventure. It’s time to bid farewell after a wondrous journey. From Toronto to Québec City, journey in 5-star luxury across Eastern Canada. Visit the spectacular Niagara Falls, Ottawa and Québec City over 9 days. 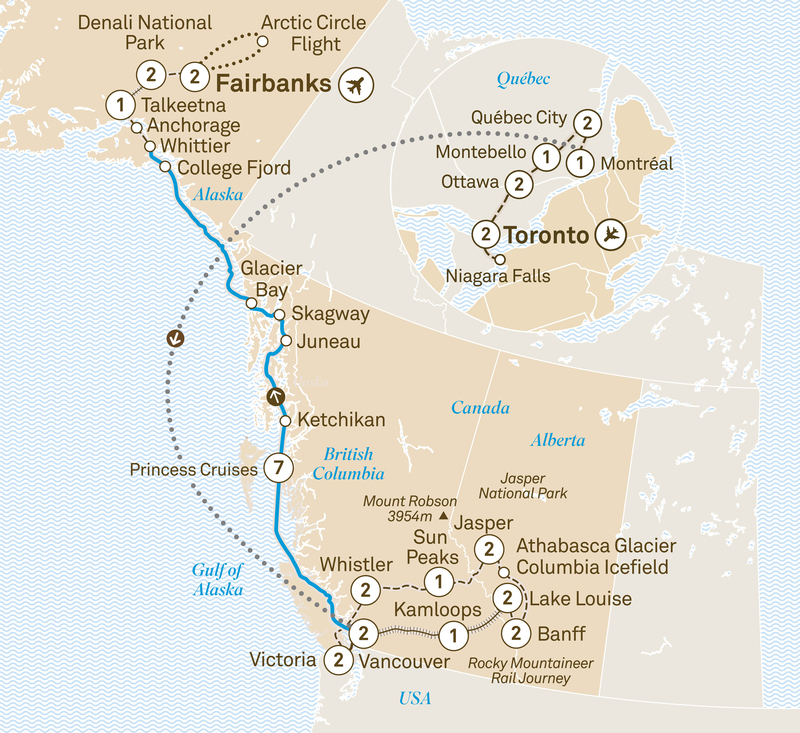 From Vancouver to Fairbanks, experience Alaska's spectacular beauty over 13 incredible days. Enjoy a Special Stay at Mt McKinley Princess Wilderness Lodge.